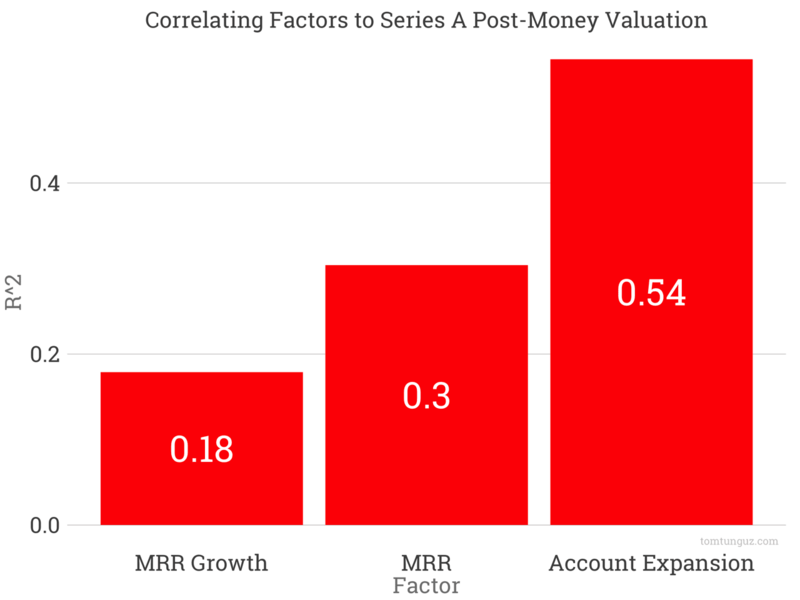 The highest correlated factor to post-money valuations for Series A SaaS companies isn’t revenue or revenue growth, but negative churn. Revenue growth correlates to post-money with a 0.18 R^2. Revenue correlates at 0.3 R^2. Negative churn, or account expansion, correlates at 0.54 R^2. Account expansion demonstrates initial product market fit. Customers are buying more of the product they trialled. Account expansion meaningfully reduces the amount of a capital a startup needs to grow. Customer success reduces customer acquisition costs by fueling word of mouth. Customer success increases or at least stabilizes the market size, because a business isn’t burning through customers. At some point in the not too distant future, new bookings from customer success will exceed new bookings from the sales team. If a product satisfies a small group of customers so well that they continue to increase their spend, investors won’t be challenged to believe that there lies a large market of similar customers who will behave identically. The data underscores why building a great product is the first order of business for a startup and why developing great customer success should be the second order of business. Many founders do this instinctively, and develop a cadre of reference customers. If you needed one more reason to develop a product, pricing plan and go-to-market with negative net churn, here it is. It’s the best predictor of your valuation when you raise your Series A.